GUELPH, ON, Feb. 7, 2012 /CNW/ - From the moment a smoke alarm sounds, occupants of a house normally have only a minute and a half to get out before they are overwhelmed and unable to escape. But this doesn't have to be the case. As demonstrated in a video released today by The Co-operators and Guelph Emergency Services, fire sprinkler systems greatly enhance families' safety. According to the National Fire Protection Association, sprinklers reduce fire-related deaths and injuries by 80 per cent, and reduce damage by 71 per cent. With fires killing 400 people in Canada each year and many more being seriously injured, sprinklers can make a huge difference. "As an insurance company, we see first-hand the tragic consequences of house fires, and we know what a difference fire sprinklers can make," said Kathy Bardswick, President and CEO of The Co-operators. "If sprinkler systems were installed in every newly built home, Canadians and their property would be much better protected." The Co-operators, which provides an insurance discount for homes equipped with sprinklers, supports making the installation of fire sprinklers mandatory in all new residential homes built in Canada. The cost of installing fire sprinklers in a new home is one to one and a half per cent of the total cost of the house. The video shows a side-by-side burn of two identical rooms - one with sprinklers and the other without. Viewers can see how quickly a modern content fire grows out of control, and how quickly sprinklers can extinguish fires and limit damage. Smoke alarms sound 13 seconds after the fires are ignited. 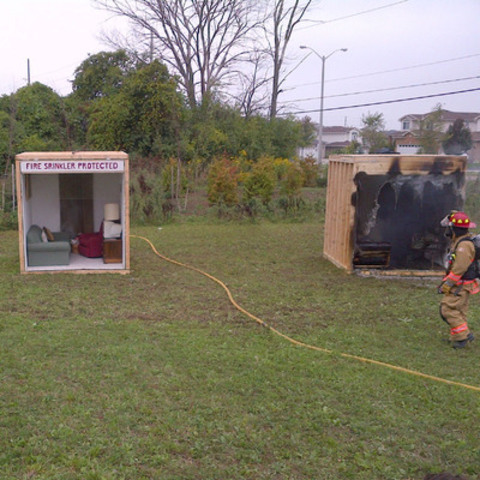 The fire in the sprinkler-protected room is suppressed in 45 seconds, while the room without a sprinkler continues to spew toxic smoke and ultimately reaches flashover a minute and a half into the demonstration. To view the video, visit The Co-operators YouTube channel or Facebook page. The Co-operators Group Limited is a Canadian-owned co-operative with more than $41 billion in assets under administration. Through its group of companies it offers home, auto, life, group, travel, commercial and farm insurance, as well as investment products. The Co-operators is well known for its community involvement and its commitment to sustainability. The Co-operators is ranked #1 among the 50 Best Corporate Citizens in Canada by Corporate Knights, and listed among the 50 Best Employers in Canada. As a proud member and supporter of the co-operative sector, The Co-operators is pleased to celebrate 2012: The International Year of Co-operatives. For more information visit www.cooperators.ca.